Pregnancy is such an exciting time of your life. Your body is changing daily, and you have a new person growing inside of you. It can also be a time of mixed health and emotions. At times, you might feel excited and full of energy. Other days, you might feel exhausted or overwhelmed. While you can’t always control the hormones or how your body reacts to the change, I found that trying to eat well can help with that. When I was pregnant, eating a healthy breakfast did wonders to give me a good start to each day. 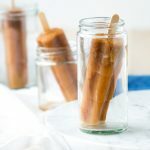 I really hope you enjoy this list of Pregnancy Breakfast Ideas. 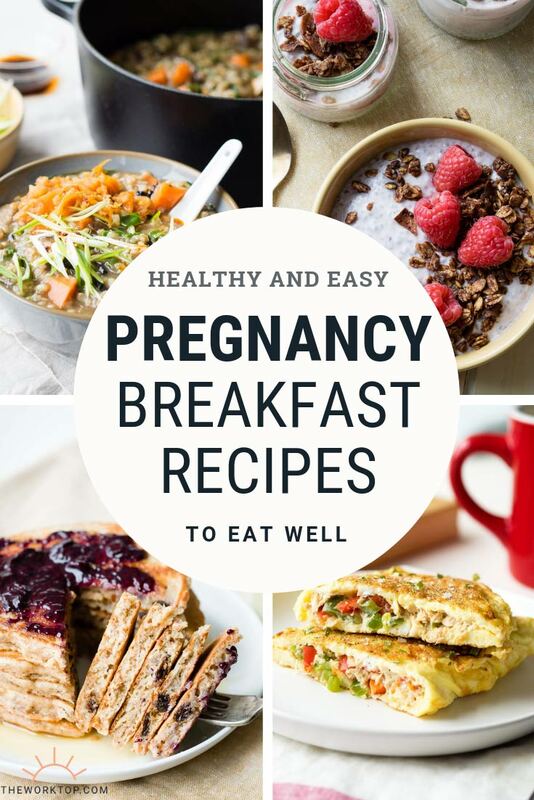 And during the course of your pregnancy, I hope several recipes from this collection make it to your breakfast table. What should you eat for breakfast when pregnant? It’s important to eat a wide range of foods while you are pregnant. Here are some highly nutritious foods that are easy to eat for breakfast while you are pregnant. 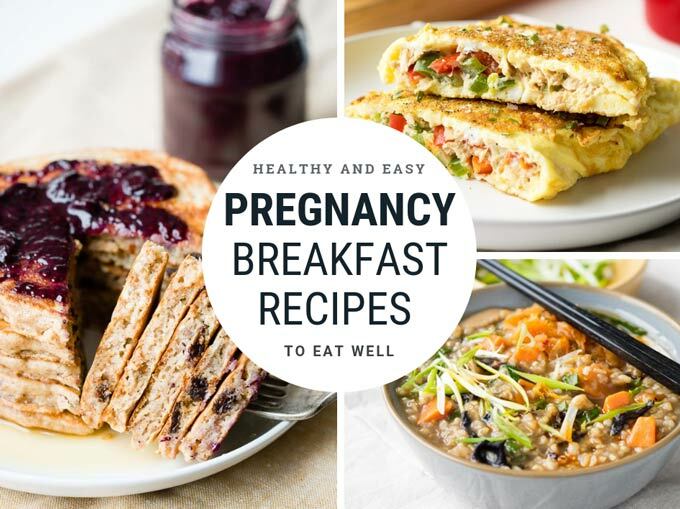 The pregnancy breakfast ideas below use many of these ingredients to give you a healthy and nutritious start to the day. 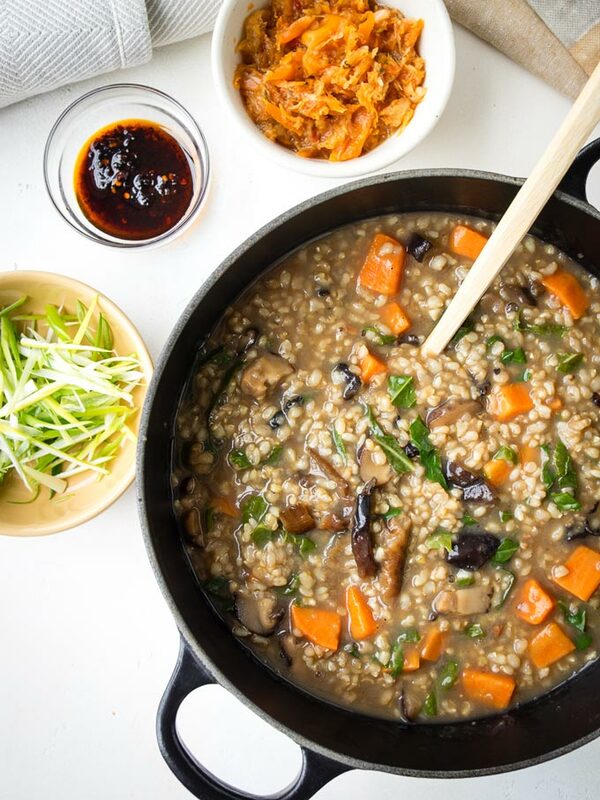 This Vegetable Congee Recipe contains collard greens and sweet potatoes, and you can top it with an egg. The recipe calls for vegetable broth, but if you aren’t vegetarian, swap it out for bone broth for more minerals and nutrients. I use brown rice in this breakfast recipe because brown rice has more nutrients and fiber. To reduce any concerns for arsenic in rice, soak the rice overnight before cooking with it. It allows the grains to open up and the arsenic to escape. It’s high in protein and calcium, both of which your body needs when you are pregnant. 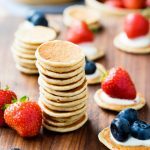 This recipe for Cottage Cheese Pancakes is great to eat for breakfast during pregnancy because it’s made with cottage cheese, eggs and oats. There’s no sugar in the recipe, and no refined flours too. It’s a GF recipe, so you can give your body a rest from the wheat. Hopefully any morning sickness passes for you relatively quickly. 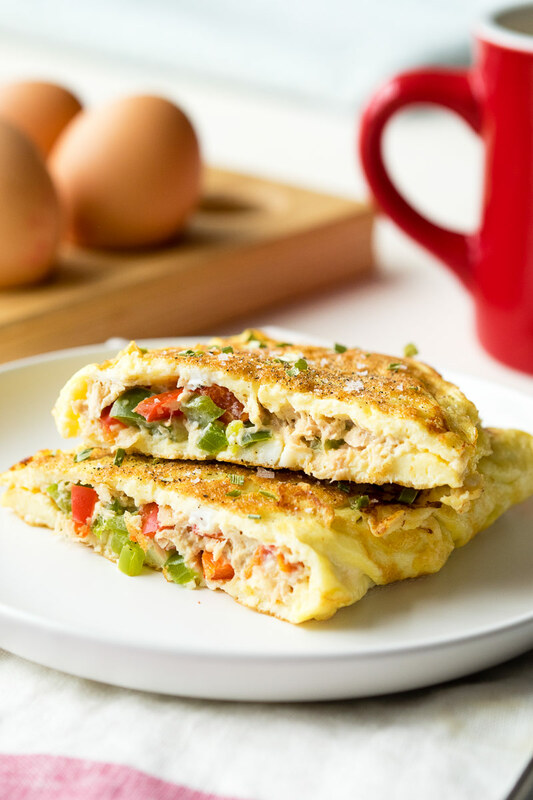 So when you are able to stomach a hearty breakfast, this Tuna Omelette is a great pregnancy breakfast idea. Tuna is a low-fat protein and contains those omega-3 fatty acids that are great for you. The other ingredients in this omelette include eggs, green and red peppers, and cream cheese. So you’re getting protein, fiber, vitamin C and calcium. If you feel like you are constantly eating for two, this hearty omelette will also help you stay full until lunch. 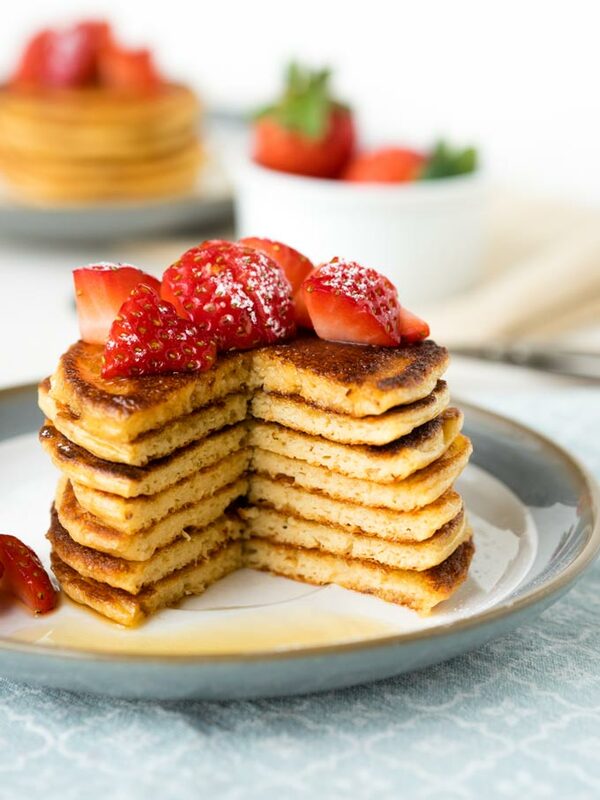 Yum.. You’ll love these Healthy Apple Pancakes for brunch! 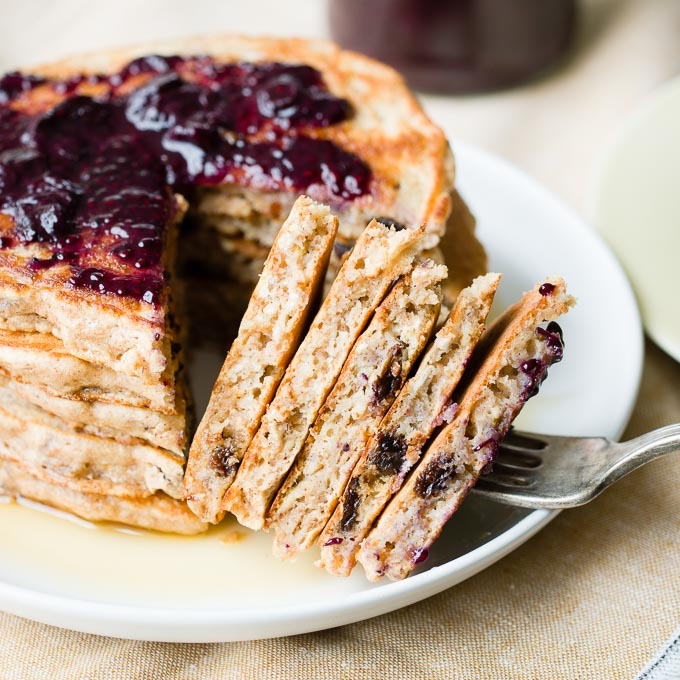 These healthy apple pancakes contain whole wheat flour, eggs, milk and raisins. With those ingredients, you get B vitamins, and minerals such as copper, iron, potassium, selenium, calcium, magnesium and zinc. All of which are needed during pregnancy. Plus, there’s no refined sugars in the breakfast recipe. 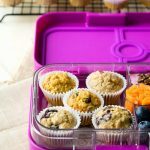 And one of the best parts about this pregnancy breakfast idea? You can make the pancakes ahead of time and freeze them. So if you make this breakfast recipe while you are pregnant and stash some away, your future self will be so grateful once your baby has arrived. Chia seeds are are packed with fiber and Omega-3 fatty acids, and contain calcium, magnesium and protein. 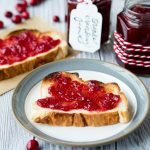 Trying to get chia seeds in your diet while you are pregnant is easy with this Easy Blueberry Jam with Chia Seeds! 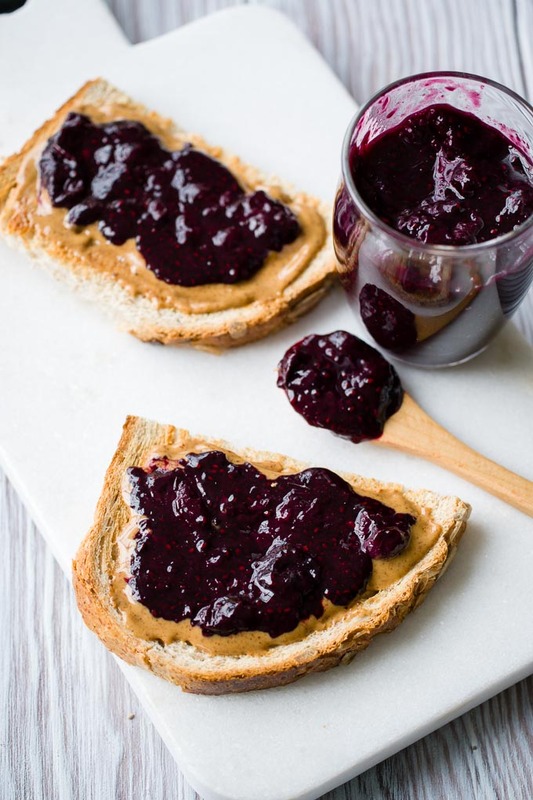 This chia jam recipe is made with just blueberries, chia seeds and a touch of maple syrup. Spread it on a whole grain toast with some almond butter (here’s a DIY one-ingredient recipe for almond butter) for a quick and delicious breakfast. 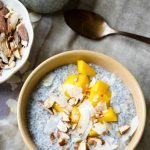 To get more chia seeds in your diet during pregnancy, you can also try making this easy overnight chia seed pudding. 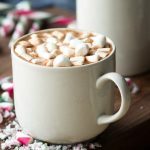 While you may put your coffee consumption on hold, that doesn’t mean you can’t start the day with a warm drink. 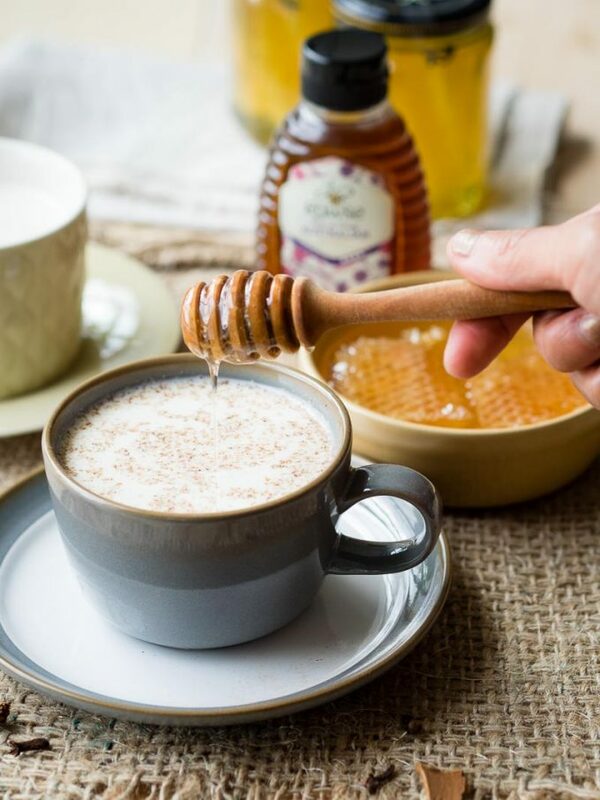 This Spiced Warm Milk and Honey drink is great to have at breakfast while you are pregnant, especially if you are looking to increase your calcium intake. An 8-ounce (240 ml) glass of milk will give you about 300mg of calcium. Always consult with your doctor for your specific needs, but general guidelines suggest between 700mg to 1,000 mg calcium a day when you are pregnant. What can I eat for breakfast while pregnant and nauseous? Trying to eat breakfast when you have morning sickness can be frustrating! Your body needs the nutrients and you might feel hungry. But at the same time, eating might be the last thing you want to do. I experienced morning sickness well through the second trimester, but I really hope it doesn’t last that long for you. Some days, I would only be able to keep down rice cakes for breakfast. 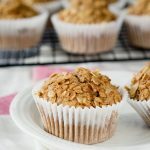 But if you are looking to try something to eat in the morning, these pregnancy breakfast ideas can help east morning sickness. 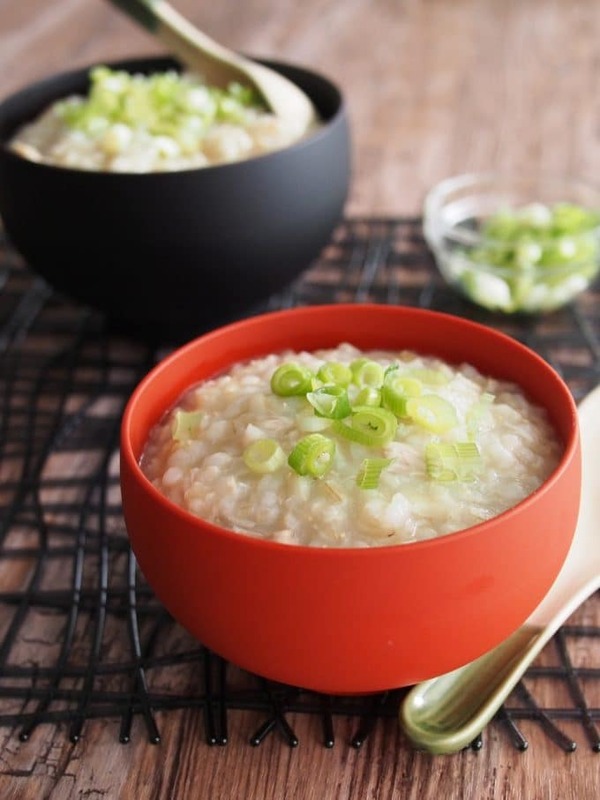 Congee is incredibly nourishing, comforting and delicious. It’s easy to make – it just requires one pot and some patience while it simmers. 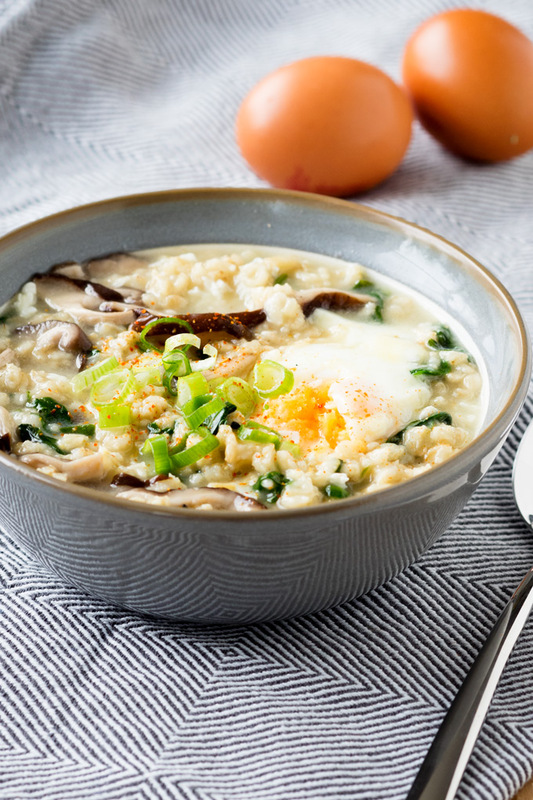 A bowl of this nourishing Savory Oatmeal with Bone Broth is great for breakfast when you are pregnant, particularly if you are experiencing morning sickness. 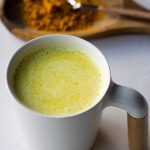 The recipe is made with plenty of bone broth which is hydrating. 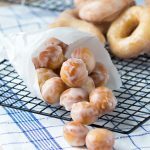 The flavors are also light, and the ingredients are easy to digest. 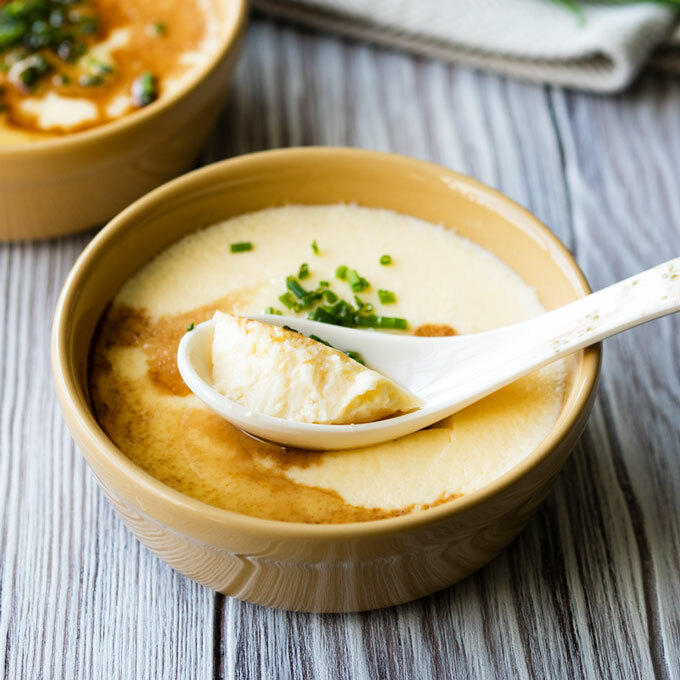 Chinese Steamed Egg is a simple recipe with only 2 ingredients – eggs and water. This is a great pregnancy breakfast because it’s simple, healthy, hydrating, and filled with protein. 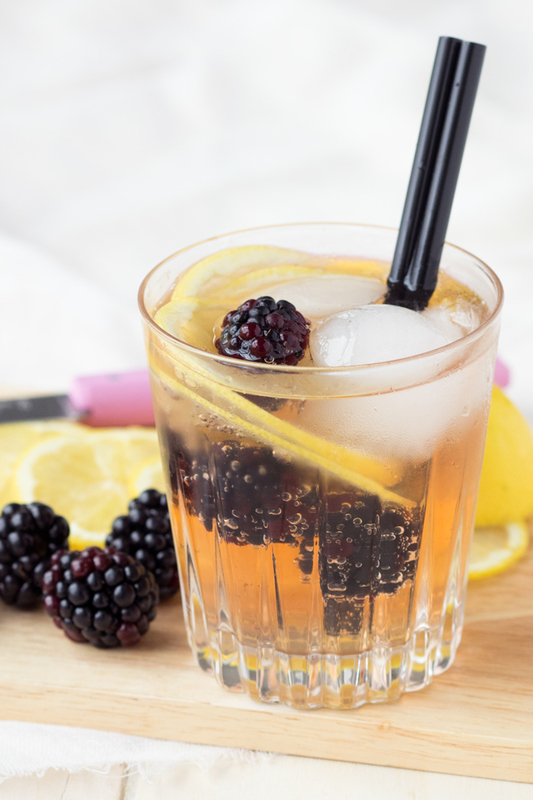 If you can keep down bubbles, I always enjoyed this Blackberry Ginger Mocktail as a morning treat when I had morning sickness. It has ginger, honey and lemon to help settle nausea, and blackberries to add plenty of antioxidants. You can swap out the ginger ale for something stronger like non-alcoholic ginger beer or syrup. My favorite is this premium ginger beer, which contains a blend of 3 different ginger roots. Or this fiery ginger syrup is one of the few that has ginger juice as the first ingredient (as opposed to cane sugar or water, which you get from other brands). Try adding this Fiery Ginger Syrup into tea or drinks, if you need a quick way to use ginger to quell nausea. Pure ginger juice is the first ingredient in this brand. Can I eat eggs while pregnant? Yes! Eggs are good to eat while pregnant. They are especially easy to eat for breakfast. Guidelines vary depending on country, but to be extra safe, make sure the eggs are fully cooked or pasteurized. That means, while you are pregnant, you’ll want to look for breakfast recipes with hard boiled eggs, scrambled eggs, well done fried eggs, or otherwise fully cooked eggs. Here’s a cookbook packed with 125 delicious recipes to eat while you are pregnant. And the best part is that it’s organized on pregnancy symptoms (think: to ease nausea, prevent heartburn, help leg cramps). Congratulations on your pregnancy and this new chapter in your life! 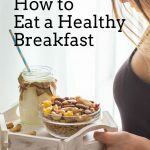 Don’t forget to pin this collection of Pregnancy Breakfast Ideas, and I’m looking forward to seeing you here throughout your pregnancy journey. During pregnancy, to have breakfast is so important to avoid morning sickness. I am obliged for this article, it will help stay fit for day and these ideas will keep us and baby healthy.